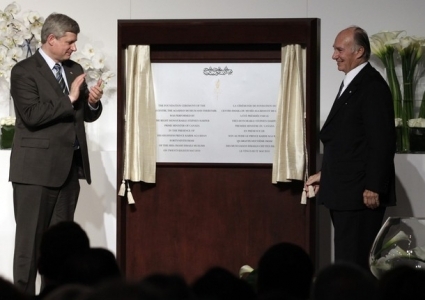 Aga Khan and Canadian Prime Minister Perform Foundation of Ismaili Centre, Aga Khan Museum and Park in Toronto - 2010-05-28 | Ismaili.NET - Heritage F.I.E.L.D. Toronto, 28 May 2010 — His Highness the Aga Khan and Canadian Prime Minister Stephen Harper were in Toronto today to mark the Foundation of the Ismaili Centre, the Aga Khan Museum and their Park situated in the city’s Don Mills area. The development of these projects seeks to foster knowledge and understanding both within Muslim societies and between these societies and other cultures. The Aga Khan Museum and its collection reflect the plurality of the Muslim world, while the adjacent Ismaili Centre will create spaces for interaction and dialogue. Together, they will offer platforms for the search for mutual understanding among all communities and cultures. The Prime Minister also used the occasion to formally announce the Canadian Parliament’s unanimous decision to make the Aga Khan an Honorary Canadian Citizen, presenting him with a certificate of citizenship, as well as a Canadian flag that had previously flown on Parliament Hill, known as a “Peace Tower flag”.